For the second time in four days, a mountain lion sighting was reported Thursday near a North County middle school. 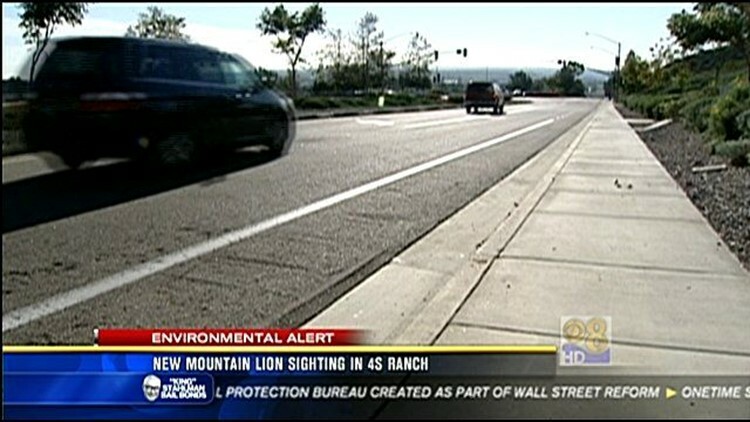 4S RANCH (CNS) - For the second time in four days, a mountain lion sighting was reported Thursday near a North County middle school. Sheriff's personnel got a "third-hand" report about 9:45 a.m. that someone had seen what appeared to be a cougar roaming near Oak Valley Middle School in 4S Ranch a short time earlier, Lt. Mike Munsey said. Administrators at the campus kept all students secured inside their classrooms while deputies and state Fish and Game officers searched the area with airborne help from a sheriff's helicopter crew. The personnel did not spot a puma, Munsey said. "That's not to say it wasn't out there, but we didn't see it," he said. The caller who reported the sighting heard about it from someone who had spoken to the person who claimed to have directly seen the big cat, the lieutenant added. On Monday, a similar scenario played out in the same general area after someone reported seeing an apparent mountain lion from across a canyon off 4S Ranch Parkway. A search turned up no such animal in that case, either.